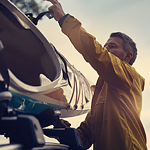 If you travel often or enjoy cycling, kayaking, or canoeing, chances are a roof rack is a necessity for you. The important thing is becoming very familiar with this useful accessory to maximize its use and minimize any damage. A roof rack that's properly fitted won't damage your vehicle. When installing be sure to read the instructions carefully. If you have questions or need help, and it's okay if you do, get a professional to lend a hand. Have questions about your roof rack? Come see us at Bill Kidd's Volvo Cars and we'll be happy to answer all your questions or help you with the install.